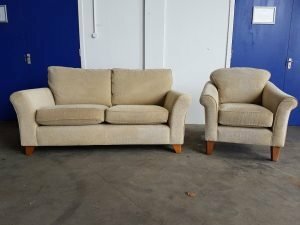 House Clearance Service In Duntocher Faifley Giffnock Inchinnan Kilbarchan Milngavie Newton Mearns. I act as Deputy for a client and wish to have the house cleared in preparation for sale. The house is a three bed roomed terraced house in Baring Street, Duntocher – Glasgow and is quite cluttered. I can arrange to send a couple of photographs or alternatively could you arrange to visit the property and give me a quote please. 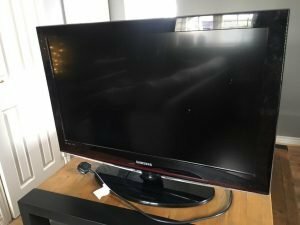 A black Samsung 32 inch flat screen LED television. 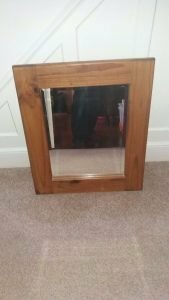 A small solid pine framed bathroom wall mirror. 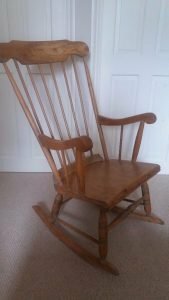 A vintage solid pine high back nursery rocking chair. 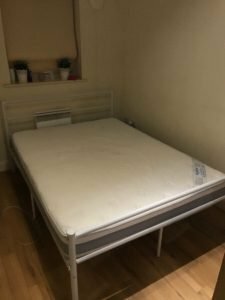 A white metal ladder back double bed frame, together with a white and grey double mattress. 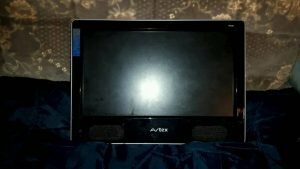 A black Avtex 22 inch flat screen television, with built in DVD player. 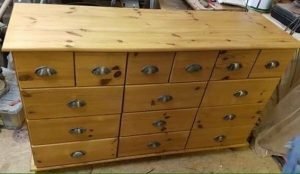 A huge solid pine chest of drawers, having six small over 9 side by side large drawers. A two seater high back sofa and matching armchair on oak legs, upholstered in camel chenille fabric. 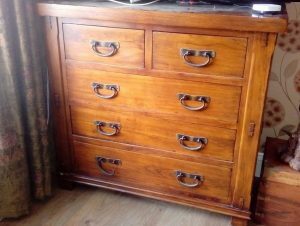 A large solid pine bedroom chest of drawers, having two small over three large drawers, with brass handles. 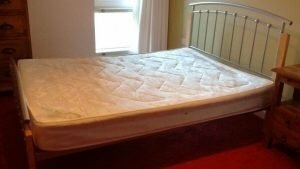 A chrome and wood double bed frame, together with a white double mattress. 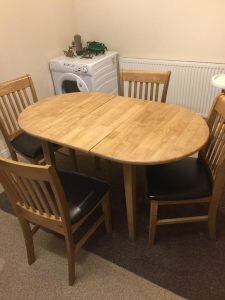 A solid oak oval extendable dining table, together with four matching high back dining chairs, upholstered to the seats with black faux leather. 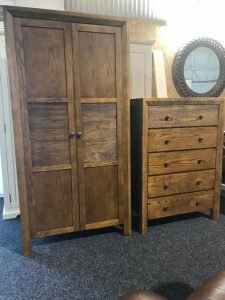 A tall standing solid oak double wardrobe, together with the matching chest of drawers. 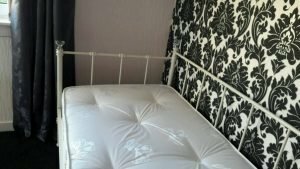 A cream metal four poster single day bed with crystal finials, together with a white single mattress. 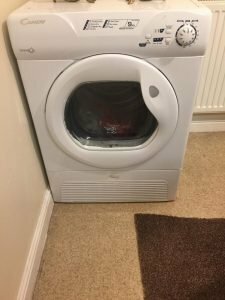 A white Candy 9kg under counter vented tumble dryer. 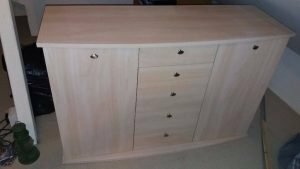 A large solid light wood curved sideboard, having a single cupboard to either side of five central drawers. 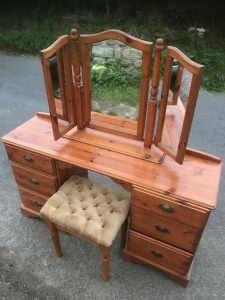 A solid pine six drawer dressing table, together with the matching tri folding mirror and velour topped stool. 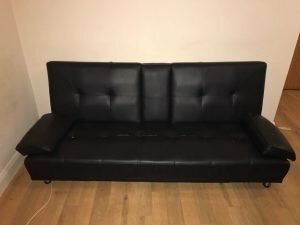 A two seater high back sofa bed on chrome legs, upholstered in black faux leather.